A ‘disgrace’, a ’national embarrassment’, and ‘Third World’ were some of the criticisms thrown at Gatwick Airport’s railway station by Crawley councillors. An application to upgrade the ageing station was put before a meeting of the borough council’s planning committee and essentially approved, with one issue needing to be addressed. A report to the meeting said Network Rail had yet to show how it was complying with policy ENV7, which centres around District Energy Networks. Large applications such as this have to demonstrate how they have considered supplying such a network, which would provide energy to surrounding buildings. Councillors said they were ‘disappointed’ that the issue had not been addressed and were told that the application would be approved by the head of economy and planning service once everything was in order. That one point aside, the committee was unanimous in its support for the application. The work will see the building of a first-floor concourse and entrance area above platforms 5, 6 and 7, the widening of platforms 5 and 6, and new lifts and escalators fitted to platforms 3-7. The new concourse would have a curved roof, while canopies would also be put up over platforms 3-7. Peter Smith (Lab, Ifield) said: “I regularly use Gatwick Airport and I think really at the moment it’s a disgrace. “It’s a national embarrassment when you see all these people coming from the advanced countries in Europe to our Third World station where they have to struggle to stand on a platform that’s barely wide enough, with no concourse and no signage in foreign languages. 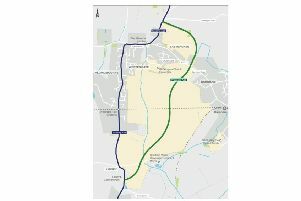 Martin Stone (Con, Ifield) added: “This is clearly a step in the right direction in dealing with the infrastructure at the airport which clearly needs doing. “For an airport that serves millions of people and is due to grow, we need a good railway station. Geraint Thomas (Lab, Northgate), who is a member of GATCOM, the Gatwick Airport Consultative Committee, said keeping the station open while building work was carried out would be ‘a major challenge’. He added: “I’m very pleased to see this going ahead. I’m sure all of us have experienced at various times the difficulties of going to Gatwick Airport station. Work is expected to start this year and end in 2022.